The restoration, repair, and maintenance of metal objects is both art and science. Our goal in hardware restoration is to reclaim the original beauty of the design, whether it be in silver, brass, pewter, copper, nickel, or gold. Greenwich Metal Finishing provides the most complete and professional metal restoration services in the area. With a full restoration services under one roof, we take broken, damaged, or worn pieces and return them to brilliance and full functioning order. Crystal Chandelier Cleaning and Restoration – Our lighting restoration department is expert at repairing all kinds of interior and exterior lighting fixtures. 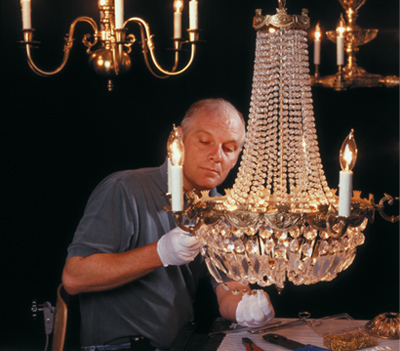 As a certified Underwriters Laboratories (UL) facility, Greenwich Metal Finishing can clean, repair, polish, and label your crystal chandeliers and sconces. We can also replace or fabricate any missing or broken crystal and glass. Trophy Restoration – Greenwich Metal Finishing can restore tarnished or dented trophies. Finishes that are worn through over time from polishing can be re-plated. Greenwich Metal Finishing is responsible for maintaining the coveted UBS US Open Golf trophy. So whether your trophy resides in your clubhouse, firehouse, or home, we can return it to its original glory. Pickup and delivery services are available within Fairfield, Westchester, and Putnam counties, New York City, Northern New Jersey, and Long Island. If you are outside our local area, we can arrange for professional crating and transportation. We carefully wrap all finished pieces to keep them secure and unblemished. For restorations encompassing entire homes, we sort and label all pieces for individual room locations. For examples of restorations and before-and-after photos, please view our portfolio.